At 1982 our department got a DEC minicomputer VAX-11/750. 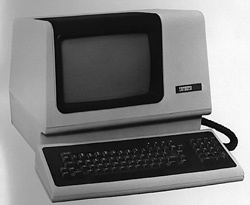 The terminals were VT100. Now it was possible to do screen editing, which nowadays is self-evident for all computer users. The first configuration of our VAX-11/750 was rather modest. In the course of time the system expanded and more features were also added on the software side. Other programs like Pascal and C were available as well as the database application VAX Datatrieve. In addition to the basic editor EDT, also TPU editor and 3rd party document editor LEX were used. Communication with other users was done via VAX Mail. My main work at that time was heading a product support group, but I somehow found myself to be a part-time VAX user support person of our department too. That work included product database management, managing our common file areas, training other users and programming tool scripts in Digital Command Language (DCL) plus some other programming tasks too. At the beginning of 90's I participated in defining a product database application running in Oracle relational database. Once ready and working I headed a support group, which was responsible for defining and deciding the further development of that system. One of the most interesting tasks was user training. 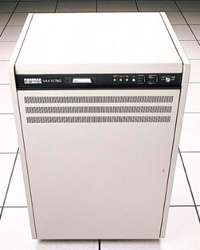 This database system was one of the few applications which would still be alive and running in VAX environment in the beginning of this century, when all other common and big applications were running either in Unix of Windows servers.